Tonight and tomorrow we commemorate Yom HaShoah, Holocaust Remembrance Day. It's not a day for Jewish humor, but it can be and should be a day to recognize acts of bravery and compassion of Jews and non-Jews who saved lives in those troubled days of the 20th century. Nicholas Winton was a British humanitarian who organized the rescue of 669 children, most of them Jewish, from Czechoslovakia on the eve of the Second World War in an operation later known as the Czech Kindertransport (German for "children's transport"). Winton found homes for the children and arranged for their safe passage to Britain.The world found out about his work over 50 years later, in 1988. The British press dubbed him the "British Schindler". Winton's parents were German Jews named Wertheim who changed their name to Winton in an effort at integration.They also converted to Christianity, and Winton was baptized. His rescue achievements went unnoticed for half a century until in 1988 his wife found a detailed scrapbook in their attic, containing lists of the children, including their parents' names and the names and addresses of the families that took them in. The wider world found out about his work in February 1988 during an episode of the BBC television program That's Life! 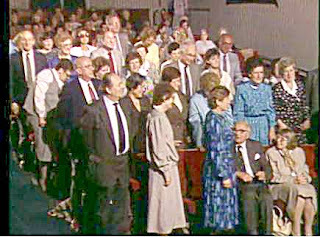 when he was invited as a member of the audience. At one point, Winton's scrapbook was shown and his achievements were explained. The host of the program asked whether anybody in the audience owed their lives to Winton, and if so, to stand. More than two dozen people surrounding Winton rose and applauded. This scene is shown at the end of the 10-minute long documentary below. In 2003, Winton was knighted by Queen Elizabeth II for "services to humanity, in saving Jewish children from Nazi Germany occupied Czechoslovakia." On 28 October 2014, he was awarded the highest honour of the Czech Republic, the Order of the White Lion (1st class), by Czech President Miloš Zeman. He died in July 2015 at the age of 106. Righteous Among the Nations. G-d Bless Sir Winton's memory. A Joke to Start the Week - "Invisible Man"
A Joke to Start the Week - "The Taxman Cometh"
A Joke to Start the Week - "The Seance"